Managing your daily appointments, events and meetings can get overwhelming as you switch between your favorite calendar applications; on your mobile, desktop, web browser. Keeping them all in sync is no easy task and to do this manually will simply not be pleasant. With Zoho Calendar, we would like our users to be in sync with their daily events automatically, even while using other calendar apps. In this light, we are glad to announce 2-way sync for Google Calendar, available for users of organizations / businesses subscribed to a Zoho Mail suite standard plan. You can enable this feature from the Zoho Calendar settings page by selecting ‘Sync’ from the left options and then following a few simple steps. Once the synchronization is complete, whenever you create, edit or modify event details in your Google calendar, the same will reflect in your Zoho Calendar and vice versa. Please be advised that it takes around 5 minutes for changes to sync at this time. We are working towards making this instantaneous. On a lighter note, we have also rolled out a birthday calendar feature to keep track of your contacts’ special day. After all, however grown up and mature we may consider ourselves to be, doesn’t a birthday wish invoke a smile at the least? In fact, a simple birthday wish may even score some brownie points with a business prospect. Just subscribe to Zoho Contacts’ birthday information in a few simple steps from Zoho Calendar and be prompt with your good wishes. We hope to come up with more updates that will help you stay in sync and be on top of your daily agendas. Please spare some time to provide feedback and suggestions on how else we can improve your calendar experience. Google apps for work seems to be gaining significant ground so full bi-directional and close to real time sync across the primary Google apps would be essential. Separately, even more customization features for zoho would be nice. Every business is a little different and we prefer to use our own vernacular and processes. There isn’t any “Sync” in settings. so, for the elementary service of optional two-way syncing between ZOHO and google calendars, one has to not only already own a domain name, but also has to then pay a subscription to ZOHO. ridiculous. How about Zoho Creator Calendars too. Its very much needed. I have read over the Zoho forums and other site content. From what I can see Zoho has elected to provide the capability to sync with Google before allowing for syncing to privately held information via CalDAV, CardDAV and WebDAV. I do not understand your priorities. 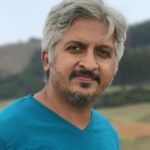 I’d imagine most people are coming over to Zoho to escape the invasive practices of of Google and the like, so much so they are willing to pay for services rather than use the free ones offered otherwise. Yet, you turn right around and make exposing their data the first option rather making an ability to sync privately your first order of business. May I suggest a reassessment of your priorities and roadmap that you might better reflect the needs of your customers? I see someone else has indicated that this is a problem already… but just to know that there are a few people that are interested sync’ing google. I didn’t even know I HAD CRM… In any case… it would be nice to have this sooner than later. I have two other calendar feeds into my Google calendar. My main Google calendar is loaded into ZoHo with no problem. The two other feeds, which Google provides as iCal urls fail to load in ZoHo. Also, loading a direct feed from TripIt, rather than its Google feed, fails to load in ZoHo. Any ideas? why are you diluting your own product by offering a path back to the evil devil’s throneroom? @Sandor, +1. Zoho: Spend more time integrating and improving CRM. Too much clicky for my taste. 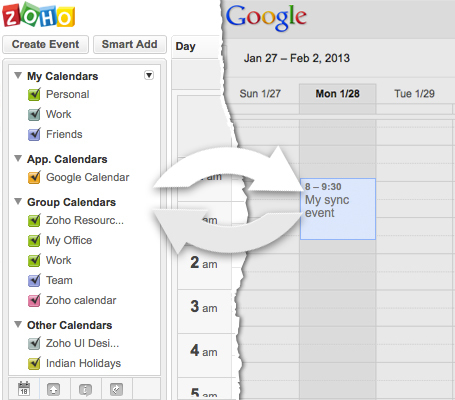 We need two-way sync between Google Calendar and Zoho Creator’s calendars. Any chance we’ll get it anytime soon? Is there a facility to sync with apple/i-phone users, or is there likely to be one soon? Login to your Zoho Calendar account. Click Settings Â» Sync.Problem, there isn’t any “Sync” in settings. Zoho Calendar integration with CRM Calendar is in process you can expect it in the near future. Hello, how about syncing with your own products like ZOHO CRM!! Don’t your individual groups even talk to each other??? You might as well be a bunch of different companies all going your own way. Your products integrate better with Zoho than they do with their own sister products.